(Nanowerk News) Howard Hughes Medical Institute scientists have simplified the chemical synthesis of small molecules, eliminating a major bottleneck that limits the exploration of a class of compounds offering tremendous potential for medicine and technology. Scientists led by Martin Burke, an HHMI early career scientist at the University of Illinois at Urbana-Champaign, used a single automated process to synthesize 14 distinct classes of small molecules from a common set of building blocks. 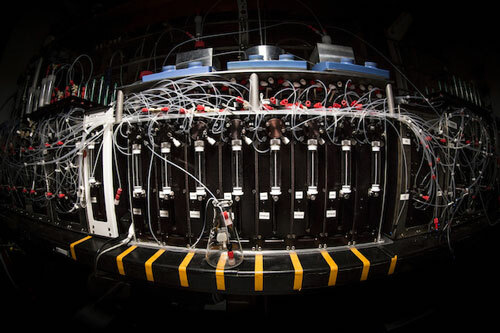 Burke's team envisions expanding the approach to enable the production of thousands of potentially useful molecules with a single machine, which they describe as a “3D printer” for small molecules. Their work is described in the March 13, 2015, issue of the journal Science ("Synthesis of many different types of organic small molecules using one automated process"). The small-molecule synthesizer that Burke's team built. Burke explains that chemists almost always develop a customized approach for manufacturing small molecules, designing a series of chemical reactions that, when applied to the right starting materials, yield the desired product. “Every time you make a molecule you have to develop a unique strategy. That customization is slow,” he says. Furthermore, it requires expertise. “Currently you have to have a high degree of training in synthesis to make small molecules,” Burke says. In his research, Burke has been exploring the potential of small molecules to treat disease. Plants, animals, and microbes manufacture many small molecules with protein-like functions, and with some precise chemical modifications, Burke suspects it may be possible to optimize some of these natural products to mimic the function of missing proteins enough to restore patients' health. To do that, he says, his team needs to synthesize and test not just the small molecule found in nature, but also new versions with targeted modifications. Burke's team took cues from nature to streamline the synthesis of the molecules they were studying, developing an approach that they have now expanded to make more general. “Nature makes most small molecules the same way,” Burke says. “There are a small number of building blocks that are coupled together over and over again, using the same kind of chemistry in an iterative fashion.” That means small molecules are inherently modular. So when Burke's team analyzed the chemical structures of thousands of different natural products, patterns emerged. “There are building blocks that appear over and over again, and we've been able to dissect out the building blocks that are most common,” he says. The small-molecule synthesizer that Burke's team built takes these building blocks – each with two chemical connectors that can be readily linked to the corresponding part on another building block -- and snaps them together like pop beads using a standard chemical reaction. The team used the approach to synthesize 14 different small molecules, ranging from relatively straightforward linear structures to densely folded molecules featuring several chemical rings. Burke says the technology is ready now to synthesize a range of very complex natural products, meaning the atom-by-atom modifications that researchers need to optimize these molecules into therapeutic compounds or technological tools are now accessible. He has founded a company, REVOLUTION Medicines, to use and continue to develop the technology for this purpose.